Prost had decided to quit racing rather precipitously in 1993, retiring after 4 championships. Senna, who had “only” been crowned thrice, faced the new season without his greatest rival, seemingly ahead of the pack. Senna, against all odds, had not managed to have the season everyone expected. He had no known rivals and it all seemed to be up to his uncanny ability to finish the year on top. The day before the race on May of 1994 at San Marino, my dad and I, and the rest of the racing world, had witnessed the tragic death of rookie Ronald Ratzenberger during the qualifying of the Grand Prix. The world was in shock, and so was the Brazilian idol Ayrton Senna. After his protege and fellow countryman Rubens Barrichello had suffered a serious accident on Friday and Ratzenberger’s tragic death, there were some suggesting the race should be suspended. Senna looked troubled, all the way to the moments before the start of the GP. Some close to him revealed his heart was not in the race, that he did not want to be a part of it. This Ayrton Senna, capable of the most risky maneuvers in the sport did not seem eager to attempt daring skills of driving on that weekend. His heart was with the deceased rookie and his friend Barrichello, who laid in a hospital bed recovering. Senna spent the morning meeting fellow drivers in an attempt to bring consciousness about the need to increase safety standards in the sport. Not even the best novelist could have made this up. Sunday came. My dad and I sat on the couch and turn the TV on at channel 10. 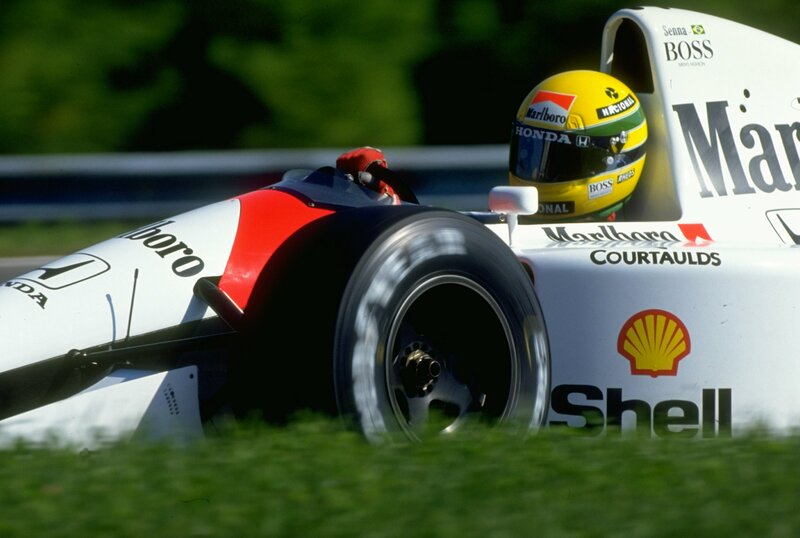 Senna had managed to finish first in the qualifying. He started in what would be his last race in the first position. Always first as he was meant to be. The charismatic talent had a country following his every move. F1 had enjoyed a surge in popularity. Prost and Senna were to blame. Their rivalry, their struggle, their talents had never been seen before, especially not at the same time. In 1994 Senna was alone ahead of the pack, no Prost. The opportunity to truly dominate the sport in the coming years was there. Senna led the first few laps until he lost control in the now infamous curve of Tamburello, just a couple of turns after the very spot where Ratzenberger had died just a day before. The side collision was fast and horrendously powerful. 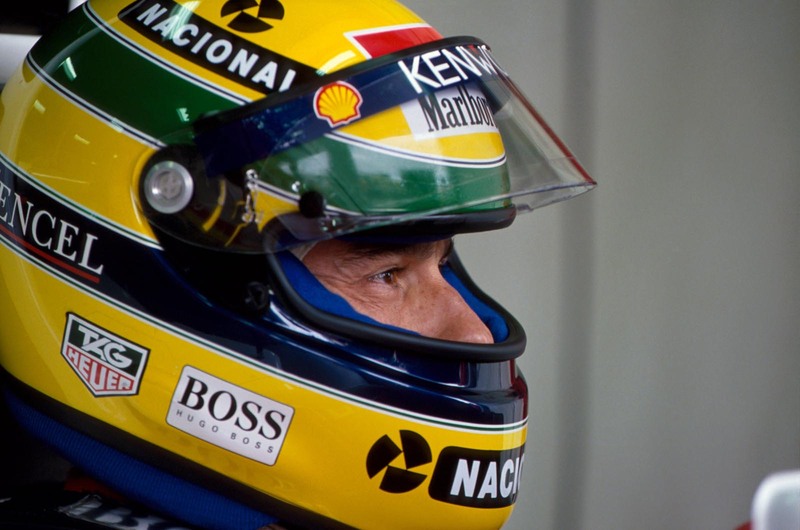 Senna received a major blow to the head from the right suspension of his car. Had the blow happened a few inches higher or to the side, Senna might have still made it out. Instead, the beloved son of Brazil remained motionless inside the cockpit. The undisputed talent and 3-time world champion who could have won a lot more had the cars he drove been as sharp and fast as his talents was not moving. I remember the panic stricken faces of the racetrack crew and the chopper taking him to a nearby hospital. More than anything, I remember the black drape used to cover the horror from tv broadcasts. Once again, a force of nature had left us mere mortals all too soon. I was in shock and so was my dad. The moments after the accident are perhaps clearer in my head than those that preceded it. The German driver just behind Senna on San Marino, a certain Michael Schumacher who would take the crown in 1994 and six times after that, would take the lead and go on to win the GP. There were no celebrations, everyone had their hearts set on Ayrton Senna’s troubling condition. It only took a few hours, but Senna never had a chance to survive. The brain injury had been too severe. The legend was gone. As soon as the race was over and the news filtered of his passing I raced to the shower, pretending I needed one. Not a second after I stepped in, the tears began to flow. I had never cried about a stranger before. To me, however, this was no stranger. He had been a part of my Sundays for at least 3 years. A constant presence in my TV screen. I had lost my first true idol. My dad, who preferred Prost all along, could not help but sympathize. The awesome documentary released last year could not help but paint a very favorable picture of the idol. He was not universally liked but he was far too charismatic, too passionate, and too good of a person for the film to have been any different than it was. The Senna of the film is the Senna a sport and a country fell in love with. The Senna of the film was a hero to the poor, a role model to look up to, up until the very last moment. I watched the film and was an emotional mess throughout. Rarely has a film produced such a strong emotional response from me. I did not only tear up at what I knew was coming but a part of me wished the story could be different and that, somehow, Senna was still alive. The film also reminded me of my father who has now been in a better place for just over two years. The film brought all of those memories to the fore, as if I was still a child, watching the races next to him. I could not have known Senna without my father and for that, and many other things, I am eternally in his debt. Thanks Dad, thanks Ayrton Senna da Silva for such wonderful years. We share some of the same memories of Senna. Like you, I was too young to really appreciate F1. But I remember sitting down and watching it when I was with my brother and my dad, before Sunday lunch (and sometimes during). We had the official F1 game on our Amiga and I always played as Ayrton Senna. I remember watching the San Marino. I remember the crash. I was 10 at the time. Very sad time. This documentary is perfect for Senna. It’s honest, it’s a joy to watch and actually feels like a film not just a documentary. There are villains and heroes. Even though I knew the ending, I was still unprepared to see it again. I was in tears! Senna is probably my all time favourite documentary. Just a fantastic send off for a great man. I don’t know if I am prepared to say it’s my all-time favorite documentary, but it’s certainly the one that feels closer to me. The next time I watch it I’ll probably find myself in tears once again. I can’t tell you how personal it all feels to me, especially when it comes to the memories of my dad. Very sad indeed. While I actually found the documentary to be vastly underwhelming, this post was beautiful. It’s unfortunate such a young talent was taken away form us so soon. One of the best pieces I’ve read in a while. Great job, Niels. Wow. As Sam said, this is a beautiful post, Niels. I caught this documentary earlier this year, knowing little-to-nothing about F1 racing, and I couldn’t help but be moved by the film. Senna seemed like a well-loved man, a very charismatic one at that, and it’s incredibly sad that his life was taken so soon. a very beautiful post. thank you for sharing your personal memory of the moment linked to this film.